Last autumn an appeal to the Friends raised an amazing £10,000 towards the conservation of The Garden Court, a beautiful painting by Sir Edward Burne-Jones. 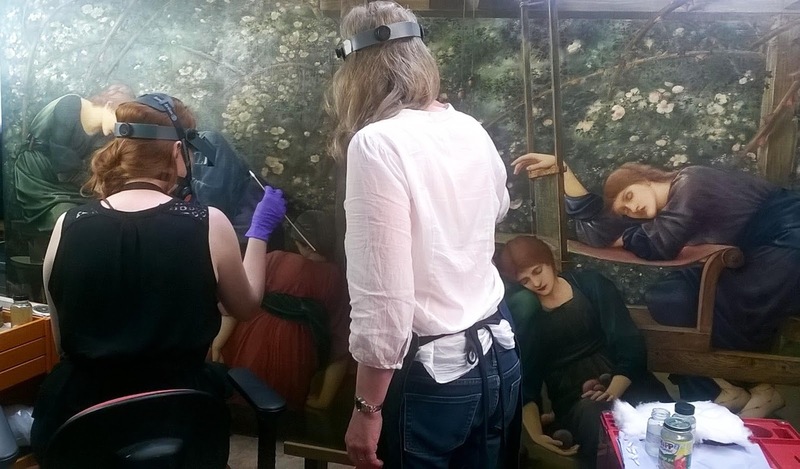 Conservation work is now unveiling the true beauty of Burne-Jones’ sleeping maidens. However, the long restoration path has presented a number of challenges along the way for conservators Hannah Tempest and Rachel Howells. When Hannah and Rachel began to remove the large canvas from its stretcher they discovered that Burne-Jones had at some stage in the 30 year painting process glued brown paper to the original canvas edge and then painted over the top. Over the years the paper had oxidized and become brittle, and underneath it were rusty tacks that secured the original canvas. The conservators knew the canvas top edge had torn in places, but on closer inspection it transpired that the weight of the many layers of paint Burne-Jones had applied had resulted in the canvas only being held on by its middle third, the outer two thirds were not supporting any weight at all. These were all unforeseen discoveries and ones that required a lot of time and painstaking work to rectify. There have been some nice surprises too. Infra-red photography revealed some interesting amendments Burne-Jones made to the composition as he revisited the painting over time. It appears that the red haired maiden on the far left of the picture would possibly at one stage been without her top plait, and instead an elongated hand would have extended further along the top of her crown. Other photos allude to alterations of shoulder positions and draping hands and fabric. Once work is complete The Garden Court will form the centerpiece of the Victorian and Edwardian Gallery and will be displayed for the first time in over 18 years. Curator Dr. Jenny Gaschke said “I’m so grateful to everyone who supported the appeal because having this incredible painting conserved is like having a new painting for the collection. Rachel and Hannah’s skilled conservation is revealing so much about Burne-Jones’ artistic practice, it’s enlightening”.